Repellents and insecticides pack more of a punch when used as part of an integrated pest management program. Warm weather plus horses unfortunately equals flies -- nasty, biting flies that irritate horses and aggravate their owners. And they're more than a nuisance; flies can spread parasites and the viruses and bacteria that cause several equine diseases. Repellents and insecticides provide quick and effective relief, but if you want to control flies over the long term you'll need a comprehensive strategy. Here are 12 suggestions to keep your horses more comfortable, and make your facility less hospitable -- and even downright hostile -- to winged pests. 1. Keep up with your waste removal program. It takes house and stable flies 10 to 21 days to go from egg to adulthood, so breaking their breeding cycle means getting fresh manure out of their reach weekly. Removing manure from the property would be ideal, but composting also works. In addition to manure, a compost pile can dispose of wood scraps, fallen leaves, grass clippings and other organic waste. 2. Spread manure selectively. Avoid spreading fresh manure over pastures that will be in use during fly season; when manure is spread, apply it in as thin a layer as possible so it dries out quickly. When spreading over crop fields, disk fresh manure under the surface of the ground to kill any eggs and larvae. 3. Repair leaking plumbing. Dripping water creates a moist environment ideal for fly eggs. Periodically check faucets, pipes and waterers for leaks, and when you repair them, fill in any puddles they've caused. 4. Keep stalls dry. Stable flies are attracted to the smell of urine, and they lay their eggs in urine-soaked bedding as well as manure. Remove wet bedding from stalls at least once, preferably twice, a day. Sprinkling a little hydrated lime over wet spots on the stall floor can help deodorize and dry them out -- reducing their appeal to egg-layers. 5. Eliminate puddles and standing water. Stagnant water is an ideal breeding ground for several species of biting flies. Fill in potholes in your driveway, level areas where puddles routinely appear, and remove any debris, such as old tires, that collect rainwater. Make sure drainage and runoff systems around the barn are free of clogs. 6. Keep drinking water fresh. Rinse and refill water buckets daily; dump old water in an area where it won't create puddles, preferably outside the barn or into a sink or drain. If a stall is vacant for more than a day, empty the water bucket and place it upside down to dry. Skim algae and floating debris from troughs daily and top them off with fresh water. One easy way of keeping troughs of 100 gallons or more clean is to add fish that eat algae, insects or larvae. Ask at your local aquarium store for recommendations about types of species and the number of fish that might work for you. 7. Set fly traps. Traps are an effective way of reducing the adult insect populations, but in general they work best in smaller, enclosed areas -- and in conjunction with other methods of fly control. Baited traps. Baited traps can attract large numbers of house and stable flies, which are drawn into an inescapable chamber by the scent of an attractant, such as a sugary food. Tapes and glue traps. These strips, covered with an aromatic, sticky glue, catch curious house- and stableflies. They also catch dust and other airborne contaminants and need to be replaced every few weeks or as soon as they lose their stickiness. Physical traps. Bait-less traps rely on the fact that horseflies are attracted to dark objects. A large round black ball attracts flies to land on it; when they do, they crawl upward to the top of the sphere; when they discover there is nothing here to eat, they fly up -- and into netting that forms a cone above the ball; attracted by the clear space at the top of the cone, they continue to fly or climb upward, until they are trapped in the collection chamber. 8. Bug zappers. These familiar blue-light devices delivering a satisfying sizzle when flying insects hit the electric grid; one drawback is that they also attract beneficial bugs. As with any electrical appliance used in the barn, make sure the zapper is plugged in, grounded and secured where it can't be knocked over. It's also important to keep the trap clean to avoid a buildup of flammable dried bodies. 9. Outfit your horse with protective garments. A variety of products can prevent flies from reaching your horse's sensitive skin. For turnout, try to discern which species of flies are bothering your horse. 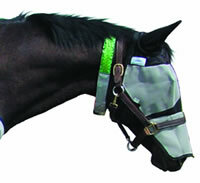 Ear nets protect against blackflies, while mesh leg wraps keep stable flies at bay. Masks protect against face flies, which like to congregate around the eyes. Light-colored fly sheets offer double protection: They are a barrier when flies land, and their brightness deters horseflies, which are attracted to dark colors. 10. Retreat from the midday sun. Many biting flies are most active in bright daylight, so keeping your horse stabled during when the sun's at its highest can protect him from these pests. If you prefer to leave your horses in the pasture, make sure they have access to a deep, shady run-in shed. For added protection, hang long strips of burlap, carpet remnants, sheets or other fabrics in the doorway, to within two feet of ground level. 11. Apply repellents. Many effective commercial repellents are on the market as are numerous essential oils (including citronella, cedar oil, neem seed oil, eucalyptus oil, tea tree oil and lavender oil) which are common ingredients in repellents, both commercial and homemade. The first time you use any substance, be sure to check your horse for sensitivity; apply a small amount to a small area of your horse's skin that doesn't come in contact with tack and wait a few hours to see if a reaction occurs. 12. Harness the power of garlic. Ever notice how a distinct smell will stay on your breath and skin for hours or days after a garlicky meal? The strong oils in garlic are excreted through the skin and lungs, providing a potent scent that can repel insects. Fresh garlic can be tricky to feed to horses, but powdered garlic can easily be added to the feed. Start with a very small amount, until the horses get used to the new flavor and slowly increase the dose to a tablespoon or two each day. This excerpt is from the article "25 Ways to Bolster Your Fly Control Program" which originally appeared in the May 2001 issue of EQUUS magazine. Personal stylist Barbara Biernat tells you how to dress your shape to look great in and out of the ring. We spend hours ensuring that our horses are meticulously groomed and sharply outfitted, from their smoothly braided forelocks to the tips of their polished hooves. But this often comes at the expense of our own appearance. After all, how often do you head out to the ring with a gleaming horse but covered in dirt yourself? Feeling confident and comfortable in your riding clothes not only makes it easier to transition from the barn to wherever your day takes you, but it might have more of an effect on your riding than you would think. “Dressage has so much to do with attitude. If you feel like a million bucks, you ride a little bit better,” says Barbara Biernat of Horse & Rider Boutique in Los Angeles, California. Biernat is the outfitter of international-caliber riders such as Adrienne Lyle and Debbie McDonald and uses her skills as a personal shopper to add extra polish to their image in the show ring. Here, she shares her advice for looking your best in breeches and beyond with special consideration for women’s unique shapes. Whether you find yourself top-heavy, bottom-heavy or more straight-lined, a few tips from this pro might change the way you think about riding clothes. Tuck in your shirt. It is always flattering and regardless of your shape, untucked shirts tend to look frumpy. A good vest is everyone’s friend. Correctly fitted, it can conceal problem areas, help create a desirable silhouette and look neat and professional. Stick to breeches made from a thicker cotton material or even denim. These tend to be the most flattering fabrics because their thickness offers structure and helps hide imperfections. Choose pants with a wider waistband and wear a wider belt. This is usually more flattering and more comfortable for all shapes and sizes. If you like to ride in full-seat breeches, always choose pants that have a darker seat, such as white pants with a gray seat. This creates a slimming effect. Never wear darker pants with a lighter seat. Unlined jackets tend to be cut for a tighter fit. If you want to give yourself a bit more room for comfort, order up a size. Wear a thin shirt underneath the more snug fitting technical-fabric show coats to reduce bulk. Similarly, avoid large belts under technical coats to prevent unflattering bulges. Reach for shirts with princess seams, which are flattering because they provide shape and definition. Straight looks tend to not flatter those who are heavier up top. Invest in a quality sports bra, which is crucial for a comfortable ride and a polished look. Wearing the correct sports bra also can affect the fit of shirts and coats. Make sure to wear a sports bra to the tack shop when you try on shirts and coats because it will affect gapping. If a coat fits everywhere else except in the chest, you can have the button moved horizontally to loosen or tighten the chest area. Look for shirts with gussets—usually triangular pieces of fabric sewn into a seam—to help create definition. If you have thinner legs with a larger waist, purchase pants with a comfort-fit waistband that stretches. This allows you to wear pants that are small enough in the legs but large enough in the waist. This is better than the alternative of having to go up a size, resulting in bagginess around the legs. Avoid shirts with large prints and bright colors. Opt for breeches with back pockets that have flattering placement. Correctly placed, these can create a lifting and slimming effect. Always buy breeches that have a side seam. The long vertical line of the side seam will make legs look longer and thinner. Stick to pants that provide more structure and support, and generally avoid pull-on tights. Splurge on more-expensive pants, as cheaper pants will start to sag and won’t look as good. With pants, Biernat says, you tend to get what you pay for. Choose contrasting full-seat breeches over knee-patch breeches. Don’t be afraid to experiment with brighter colors for larger sizes. Riders over a size 32 should probably stay away from plaid, but the print can be flattering and provide a camouflage effect for smaller sizes. Wear boots that are tapered at the ankle to give the illusion of more definition in the leg. Give denim breeches a shot. They can be a great option for those with a heavier lower half, as they tend to hold you in place better. Avoid side-zip breeches. A zipper in the front breaks up the midsection. Steer clear of low-rise pants. Instead, pick breeches with a mid-rise fit. Low-rise pants tend to get saggy, and breeches with a higher waist draw the eye upward. Create the illusion of curves with high-waisted breeches. Add more shape to your seat with breeches with pockets. A correctly fitted vest can help create the illusion of a waist. When purchasing a coat, make sure that the sleeves are long enough or that there is enough material in the sleeve that can be let out to accommodate a longer arm. If you have trouble finding a coat or shirt that is the right length, order a size up and have it tailored. Look for a coat that offers the right silhouette without being baggy. Detail on the back of a coat can help to create more feminine lines. To cut unnecessary expenses, Barbara Biernat of Horse and Rider Boutique advises riders to strategically invest in more-expensive, higher-quality pieces of certain clothing while choosing more economic options for others. Helmet: Ensuring your safety should be a priority. Don’t compromise the fit of a helmet for price. Schooling breeches: Investing in quality breeches for schooling trumps spending money on show breeches. Schooling breeches tend to get the most wear, so make sure you buy styles that last and opt for more economical show breeches. Boots: Footwear needs to stand up to a lot of use, and shoes made with good leather are worth the investment. Coat: More-expensive coats usually have better tailoring, which gives a sharper appearance. Gloves: Explore less-expensive options for gloves, as there are plenty of options on the market that provide good quality for a reasonable price. Stock tie: It is difficult to tell the difference between a cheaper stock tie and a more-expensive one when it is worn under your coat. Shirt: Unless coats are waived, shirts often stay hidden. Therefore, comfort and functionality are more important than appearance. This article is copyrighted and first appeared in 2010 article of Dressage Today. It is reprinted here by permission. 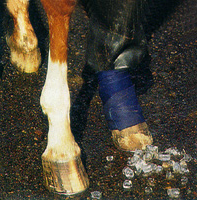 Deciding whether to use ice or heat on an equine injury depends on many factors. Here's a quick guide to when and why each therapy is most effective. When it's needed: Use when an injury is fresh--less than 36 hours old. Why it helps: During this time, damaged blood vessels beneath the skin are hemorrhaging, leading to inflammation and bruising. You'll know you're in that window because the injury site is tender and shows diffuse swelling. During this time, cold therapy will decrease the permeability of the blood vessel walls, slowing the leaks and keeping healthy, undamaged tissues from "drowning" in excess fluids. Water may be the easiest option for cooling an injury site, but it will not be cold enough on its own. You'll need to use ice, a commercial cold pack or another cooling system. Schedule: Apply cold therapy for 10 to 20 minutes at a time and allow at least 30 minutes between treatments to prevent damage to tissues. Repeat the cycle as often as you can, but you'll need four or more sessions per day to really see results. Continue cold therapy until the area no longer swells between treatments. When it's needed: When a healing injury is less painful to the touch and the swelling has more distinct edges. At this stage, any palpable lump will be firmer, feeling like a peeled hard-boiled egg. Why it helps: Alternating hot and cold therapy encourages the body's natural "cleanup crew" of white blood cells and natural chemicals that engulf and destroy dead cells and other physiological debris. The application of heat speeds circulation to the area, while cold will restrict it. Alternating the two creates a "pumping" action that speeds healing. Too much hot therapy, however, can cause hemorrhaging to begin again, so hold off on moving to this therapy for a day or two if you're unsure of the wound's status. Schedule: Begin by applying heat, 10 minutes at a time increasing to 20 minutes over a few days. After each heat session, apply cold therapy for 20 minutes. Repeat this at least four times a day until there is no localized swelling around the injury. When it's needed: When there is no pain associated with the injury and only minor swelling remains. Why it helps: Heat supports the final stage of healing, when the body is actively replacing cells and repairing tissues with specialized cells delivered via the bloodstream. Applying heat at this point boosts circulation to the area, speeding the cleanup. Schedule: Apply heat therapy for 20 minutes at a time, with at least 20 minutes of rest between treatments. Of course, never apply anything to your horse's skin that is uncomfortably hot to your own touch.